The Old College at Edinburgh University is a stunning 18th century listed building; it is the most iconic building in the Universities estate. The Old College was to undergo an exciting and ambitious refurbishment to restore and renew the building to create a state-of-the-art campus fit for a 21st-century legal scholarship. The project required internal and external structural refurbishment. Generation was approached to fulfil all of the components for this project. Our Client knew that such an ambitious and important job, to create world-class facilities for a world-class law school, needed the help and knowledge of Generation UK. 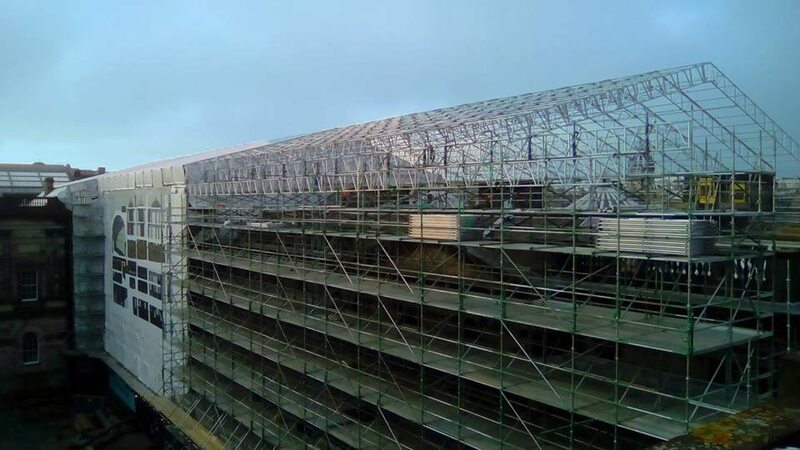 After a number of access concept and solutions were proposed by Generation Hire & Sale, our client decided that the most efficient, effective solution for this high-profile site would be our industry leading Genlok System Scaffold. The Genlok structure provided a safe and efficient working platform with clear working lifts and handrails. The System worked perfectly as it is completely compatible with tube and fitting and 200% faster to erect over traditional tube and fittings. The External works also required a large-scale temporary roof, measuring 100m in length by 24m width. With this project being performed on the listed building it was essential to have a safe, quick and easy temporary roof system that could be erected and dismantled with minimum impact on the surrounding area. The UNIRoof worked faultlessly for this project, as its lightweight and minimal components meant little disruption was made and a quick erection time, used in conjunction with the 1.3m Deep Asterix Beams it provided savings in time and money on unnecessary labour. Craig Watson, Edinburgh Branch Manager “Our client has used Generation Hire and Sale for several years. Our close working relationship with all of our customers ensures that we offer the best possible solution every time regardless of the type and complexity of the project, working with our internal designers alongside our stock holding which is in excess of £50m. We ensure that our clients’ projects are delivered on time with the reliability of our knowledge and service…”.